First Obama was for small budget deficits. Then he decided he really wanted more investment. For a while it looked like he was going to support universal health care. But now he wants young poor workers to subsidize rich old men and women. WASHINGTON (AP) – If you’re a senior citizen and earn less than $50,000 a year, Barack Obama has a deal for you: a life free of federal income tax. What is Obama thinking? Is he serious? I realize he is not much smarter than George W. Bush was in 2000 when it comes to policy, but even Bush’s income tax cuts could theoretically have worked. Obama’s tax plan looks like a bigoted attempt to buy off the vote of rich seniors, forcing young workers who are trying to afford health insurance, buy a home, or pay off their student loan to subsidize those with a lot more wealth than they have. My readings in psychology and history makes it very difficult for me to understand how anyone could adhere to a Misesian form of Austrianism with its commitment to praxeology. In short, I really think praxeology is a rotten foundation for any system of thought. I don’t care for the personal attacks in Razib’s original post, but he raises a good question: considering how bad we are at introspection, why should we trust introspection to build an economic order? Anyone from Chicago Boyz care to answer? “The Energy Challenge,” by Stephen F. DeAngelis, Enterprise Resilience Management Blog, 12 June 2006, http://enterpriseresilienceblog.typepad.com/enterprise_resilience_man/2006/06/the_energy_chal.html. Of course, China could buy state-of-the-art equipment that helps reduce the pollution created by coal-fired plants, but it fears that doing so could put the brakes on its economy, something it believes it can’t do at this stage of its development. As a result, it buys antiquated equipment from local manufacturers, burns indigenous coal, and refuses to ask consumers to pay for measures that could protect their health. The article estimates that 400,000 people a year die in China from pollution-related illnesses. As its population ages and the long-term effects of pollution begin to kick in, the piper that China refuses to pay today will cost even more tomorrow in health care costs and subsequent productivity reductions. In Beijing and Tianjin, I saw the face of pollution. But even I didn’t see the 400,000 dead in Zhongguo per year. I am lucky I was merely robbed of the sky for a month, not my life like that annual half-million. I was merely sent to the Emergency Room. Next, the hope. (Hint: it’s a geogreen gas tax). With oil prices continuing to break records, the time is rapidly approaching when it will become economically feasible to pursue alternative fuels. Despite the pain we feel at the pumps, the benefits of increasing our use of alternative fuels will be worth it in the long run. A few companies have already begun to see how “being green” makes them more resilient — both to the vagaries of the energy market and by attracting “green” consumers and investors. Another New York Times article [The Greener Guys; A Few Companies Take Special Steps to Curb Emissions,” by Jad Mouawad] discusses their strategies for reducing their carbon footprint. Creating a more beautiful, healthier world. We can do it. By distributing the proceeds of the geogreen gas tax directly to the American people, it may even be popular to do so. Increase the gas tax to $5/gallon. Shrink the gap! Republican Senators Understand Barnett’s "Flows"
Most American taxpayers would get $100 rebate checks to offset the pain of higher pump prices for gasoline, under an amendment Senate Republicans hope to bring to a vote soon. “Our plan would give taxpayers a hundred dollar gas tax holiday rebate check to help ease the pain that they’re feeling at the pump,” Senate Majority Leader Bill Frist announced Thursday. This is an amazingly good idea. It will make the New Core’s (Argentina, China, etc) rise easier, by not making them compete with the Old Core for energy sources that the Old Core doesn’t need. It sets an environmental standard that the people of the New Core will see and demand for themselves. The $100 rebate for expensive gas is a great idea because it paves the way for a geogreen gas tax. As I proposed last year, and reiterated again this week, we need a high tax on gasoline that is rebated in direct payments of heads of households. This has the benefit of discouraging gasoline consumption, while not taking discretionary spending dollars away from average Americans. In particular, this plan is much better than the insane Democrat Party alternative which would suspend the gas tax. At a moment when the American people are most aware of the dangers of dependency on foreign oil, the Democrats want to encourage that dependency by encouraging oil consumption. The Democrats’ plan is as terrible as it is hypocritical, for a party that supposedly cares about the environment. So, in conclusion, tdaxp applauds the Republican Senates for proposing this first step towards a Barnettian, geogreen solution to our oil woes. And tdaxp condemns the Democrats who would harm our environment, and our national security, by supercharging oil consumption. Think geostrategy. Think environmentalism. Think “geogreen.” And think Republican. The current high prices for oil and gas gives us a great opportunity. They focus the minds of Americans on the great problems in the world today. The American People will make great sacrifices to achieve a Goal, but will not tolerate meaningless hardship. The currently high prices are meaningless. They represent nothing more than the fluctuations of supply and demand, instability and war. President Bush should turn this around. He should announce that gas prices will never come back down: that we will never subsidize Oil-Tyrants again. He should do this with a new federal gas tax, which will floor the price of gas at five dollars per gallon. This money should not go to the general treasury. Instead, it should be immediately divided evenly given to heads of household as a monthly check. Immediately, this would make those who consume a lot of gas (and thus support the destructive policies of Iran, Saudi Arabia, and Venezuela) subsidize those who do not so contribute to geopolitical instability. Better, it would encourage the economy to swiftly move to other sources of motor power. Brendan is a long time friend of mine. I’ve known him long since he helped me out against The Nation Master entity, and I’ve checked his blog — I Hate Linux — regularly since before tdaxp was born. I am now proud and delighted to announce he has allowed me to host his review for The FairTax Book After reading Brendan’s column, I strongly support the tax reform he proposes. What would you say if I told you that there is currently legislation in front of the House Ways and Means Committee with 52 cosponsors that would not only eliminate the federal income tax, but also remove the need for the IRS, allow you to take home your entire paycheck without Social Security and Medicare deductions, and make April 15th into just another spring day? Sure, I might sound crazy, but The Fair Tax act of 2005 (HR 25) sets out to do exactly that. But why? Let’s face it, the current income tax system is a nightmare. Every year millions of American taxpayers (both individuals and businesses) spend countless time and money on making sure that they are paying no more than they owe, while countless others take the easy way out and just file the short form in order to save time, but end up paying far more than they owe because they didnâ€™t spend the time or energy to take the deductions that they are entitled to and instead overpay. To add insult to injury, even tax professionals like H&R Block have made mistakes with their own taxes. If its so easy for experts make mistakes, what does that say about the potential unnecessary complexity of the current system? Really the only people who understand the existing system are our legislators and the lobbyists in Washington who derive power from manipulating it with the end result of those without lobbyists having to pay that much more to make up the difference. It is time for that to end. 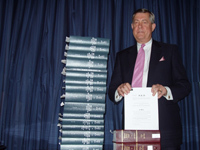 Before going into some of the details of the FairTax, take note of the image to the right of Congressman John Linder (R-GA), the author of The Fair Tax Act of 2005 (HR 25) holding it in comparison to the existing income tax code. 132 pages vs 50,000+ pages. Quite a difference isnâ€™t it? In addition to my belief in the FairTax, the reason I write this is because of my concern for the upcoming 2006 elections. Even with the new found interest in abortion and immigration reform in this country, neither in the Presidentâ€™s State of the Union, nor in the Democratâ€™s rebuttal, nor any other serious political debate so far has put forth anything new of merit that can be part of a platform for either side to rally around in order to maintain or regain control this fall. I believe that the FairTax can and should be that platform. In short… the FairTax which replaces the entire federal income tax as well as other payroll taxes with a simple embedded national inclusive sales tax of about 23% on new products and services at the retail level that would show up on your receipt every time you buy a CD, TV or even loaf of bread. At first glance 23% may seem pretty high, but consider the increased price you are already paying due to the income and payroll taxes being paid by every single company in the production chain and ending with the end consumer. With the elimination of those taxes not only would drop prices significantly, but you would end up with more of your money with every payday. As a result with the 23% sales tax being added onto a product whose price has dropped due to not having the supplying companies pay any federal taxes, it pretty much ends in a wash for you as the end buyer. Under such a system some might be concerned about a lack of exemptions for things like medical care as exists under the current tax system. It doesnâ€™t exist. Thatâ€™s right, under the FairTax system, all new goods and services fall under the tax. Without such a blanket system covering all areas of business we end up in a similar situation to what we have today… high priced Washington lobbyists campaigning for our elected officials to exempt their clients from certain taxes because of the importance of their clients business and its contributions. Again, under this system, no new product, service or person is exempted from the tax, including the poor who today pay little or no income tax and in order to allow the poor to continue to remain tax free the prebate was created in order to resolve this issue which results in the federal government mailing a check every month to every head of household for the amount of tax that they would pay during the month up to the poverty level. This way, not only do the poor not pay the tax, but no one does up to the poverty level. If you arenâ€™t already sold on the FairTax, think for a moment of the cost that US tax payers end up paying for tax compliance. Not only do many businesses and individuals hire professionals to help guide them through the process to make sure that they donâ€™t pay more than they owe… this is still an expensive process in terms of both time and money. Letâ€™s not forget that the bureaucracy that is the IRS requires massive funds in order to do its collections and enforcement, how much? For their 2005 budget [pdf warning] they requested over $10 billion. Don’t you just love the concept of paying them in order to enable them to do their much loved work? Under our current system workers and employers pay further taxes under the names of Social Security and Medicare. Under the FairTax these line items on our pay stubs disappear, but the programs don’t. Instead, both draw from the same general fund that the FairTax creates. Let’s not forget that on every payday when you take home all of your earnings and you are free to invest and save it for things such as retirement, a child’s college education, a house or anything else you want… all without any tax consequences whatsoever. Instead of the difficulty of using pretax dollars or hassle of reporting yearly income due to interest as you do today, you simply pay the embedded tax the day you spend it. In large part due to lack of time and not wanting to overload you when reading this I have not written everything there is to know about the FairTax, including answering many of the questions you likely have by this point. If you have interest in learning more, I suggest you read the book or stop by www.FairTax.org to learn more. The book, written by CongressmenJohn Linder and talk-radio host Neal Boortz, the pair set out to answer many of the questions related to theFairTax with regards to what it is, what would happen after its implementation, as well as a bit of history on how we reached the chaotic tax system we enjoy today. First published in August 2005, it debuted as a #1 New York Times best seller and its updated andpaperback edition to be released in May expected to be greeted with similar attention. www.FairTax.org is the primary online presence of the grassroots work spearheaded by the Americans for Fair Taxation group in order to provides news related to the campaign, as well as material to help us achieve our goal. Now that you’ve learned the basics of the FairTax, I encourage you to explore more of it on your own, read the book, ask questions, tell others about it, and call your congressperson and ask them to join in the campaign to destroy the existing tax system and replace it with a more fair tax, namely the FairTax. “U.S. weighs taxing health care benefits: Unusual coalition from both the left and the right looks at ending exemption for job-sponsored plans,” by Kevin Hall, Knight-Ridder, 17 July 2005, http://timesunion.com/AspStories/story.asp?storyID=379969&category=NATIONAL&BCCode=HOME&newsdate=7/17/2005. Today’s system of employer-provided health care dates to World War II, when the federal government imposed wage caps to help the wartime economy. Unable to offer higher wages to attract scarce workers, companies competed for them by offering health insurance. The war ended, but job-based insurance stuck. By the mid-1950s the Internal Revenue Service code favored it. Companies were allowed to deduct the costs of employee health care plans from their taxable income. For employees, those often-generous benefits were separate from taxable wages. Some right-leaning advocates think the tax exclusion for job-sponsored health benefits should end because it distorts the free market. The Heritage Foundation, a conservative policy-research center, says the exclusion leaves consumers in the dark about the real costs of health care, leading them to make uninformed decisions that ripple through the health care economy, driving up costs. Census Bureau data show that 82 percent of Americans who earned more than $75,000 last year had job-sponsored health plans excluded from taxation, but only 23 percent of Americans who made less than $25,000 did. Advocates on left and right agree on this: Ending the tax exclusion should be accompanied by a new national tax-credit system for health care. Tax credits would exempt health plans from taxation up to a set dollar limit. Employers would put price tags on the benefits they provide to employees — many already do this to remind workers why wages aren’t rising — and anything above the government-set limit would be treated as taxable income. This would allow the taxation of so-called Cadillac health plans, the generous ones that cover everything from fancy eyeglasses to hair transplants. This is a first step to solving our biggest domestic problem. Let’s do it.